First things first: We heard a lot about the strong dollar last week, whether it was in the president’s comments about the Federal Reserve, the resumption of trade talks between the U.S. and China, or the implementation of 25-percent tariffs by the U.S. on another $16 billion of Chinese goods. The U.S. trade deficit on goods is currently expanding at a quick pace. The administration would like to close it, and a strong dollar is, of course, working at cross purposes with this agenda by making imports cheaper. I see a strong dollar as inevitable in today’s chaotic times. I’d argue that the instability created by the trade wars is one of the big drivers of the dollar’s strength, which in turn is contributing to economic growth in the U.S. as well as adding to the trade deficit in goods that the U.S. has with China. There are a couple of facts of economic life that led me to this conclusion. First, in times of instability, countries — just like people — buy the safest currency, and thanks to the U.S. economy right now that means the U.S. dollar. We saw that in Turkey, where political instability drove people to hoard dollars, driving the lira lower. We saw that in Russia, where the central bank had to shut down hard currency trading for six days to prop up the ruble. We even see this in Iran, where sanctions have destabilized that country’s economy to such an extent that there is simply not enough U.S. currency to meet demand. An economist would explain it this way: The threat of trade wars is the main driver of systemic risk across the emerging market currency universe. I’d explain it a different way: When people don’t trust the local bank, they put their money under the mattress, and right now the dollar, thanks to the growing U.S. economy, is the world’s mattress. Likewise, threatened tariffs against China caused that country to boost its foreign currency reserves to record levels. As we discussed two weeks ago, this contributed to the yuan’s sharp drop this year against the dollar, and this has largely mitigated any upward pressure on the price of imported goods in the United States, which brings us to the second fact of economic life: 70 percent of the United States economy is just people buying things. Consumer spending makes up approximately 70 percent of the U.S. economy, and the majority of that spending comes from a more price-sensitive segment of the population. Therefore, a stronger dollar means cheaper imports, cheaper imports mean stronger consumer demand, and consumer demand means that the economy keeps rolling along despite a growing trade deficit, providing in turn safe harbor in a turbulent world for foreign investors, as well as for those who need to keep their money in a stable currency. In this way, a strong dollar actually powers a virtuous cycle, albeit one built upon growing credit card debt, and as long as the U.S. economy grows at a 3–4 percent clip and enjoys zero structural unemployment, the dollar and the trade deficit are going to keep doing what they’re doing regardless of the president’s policy goals. Since President Nixon’s 1971 decision to take the U.S. off of the gold standard, only two presidents have presided over a shrinking of the trade deficit: Jimmy Carter and George H.W. Bush, and that was because the economy went into recession during their administrations. As long as the U.S. economy is good, people around the world will mitigate risk with the U.S. dollar, especially in unsettling times. Regardless of what some politicians and policy-makers may think, that is not bad news for the world at all. 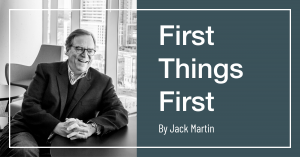 Jack Martin is the global chairman and chief executive officer of Hill+Knowlton Strategies (H+K), a multinational strategic communications firm with clients constituting half of the Fortune Global 500 list with more than 80 offices around the world.